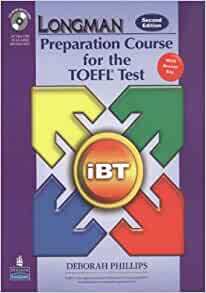 The Longman Preparation Course for the TOEFL® Test: iBT, Second Edition, by Deborah Phillips, gives students all the tools they need to succeed on the new TOEFL® integrated-skills test. Providing both a comprehensive language skills course and a wealth of practice for all sections of the test, the Longman Preparation Course for the TOEFL® Test: iBT, Second Edition, is appropriate for courses in TOEFL test preparation or as a supplement to more general ESL courses. Track your students’ progress quickly and easily. View your students’ results electronically. Read and listen to your students’ written and spoken work — then send feedback. Work from home — all you need is an Internet connection. Diagnostic pre-tests and post-tests that allow students to identify strengths and weaknesses and assess improvement in each section. Note: You must have the Audio CDs to use the listening material (the Skills Practice, the Mini-Tests, and the Computer Tests) in the textbook. The audio material on the CD-ROM is different from that on the Audio CDs. Click on "Course-Specific" Resources on the left of this page to order the Audio CDs. 5つ星のうち5.0For test-takers who earned nearly 20 and want to get 25 or more in the reading section. I really like this book. I think this is the best materials for reading section.